There are hundreds of exchange websites out there today on the internet! This is because the need for BTC has grown over the past six months and has continued to do so with strong numbers. 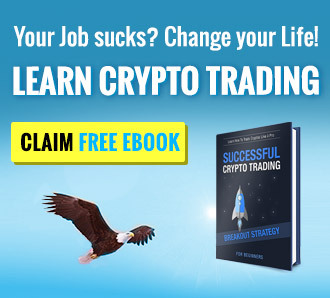 The demand for BTC trading websites has also exponentially grown over the years making BTC trade more “regional” making room for local websites to flourish in their own backyard market. We are talking about websites that are focused on providing exchange services into their own countries and often disregard outsider traders. Today, we will be looking into Bitcoin.co.id a local Indonesian exchange website that focuses on the Indonesian region. The question is, can outsiders create an account with them without any problems? As a world trader, we need to know where to get BTC not just from within our own regions but from all over the world. Bitcoin Indonesia or better known as Bitcoin.co.id is a crypto exchange company based in Indonesia that was launched way back in 2013. 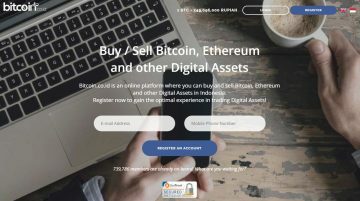 The company claims that they have over half a million registered clients that trade over half a billion Rupiah on a daily basis making them the largest crypto exchange website in Indonesia. 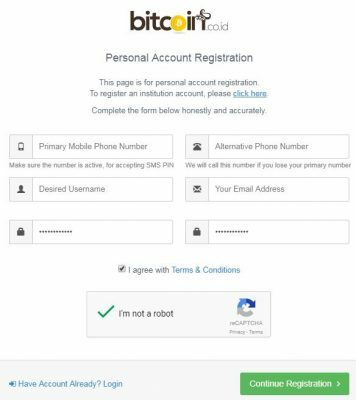 To create an account with Bitcoin.co.id, all you need to do is click on the “REGISTER ACCOUNT” button found on their website homepage. There are two different types of accounts you are able to create in this website, first would be the personal account registration, which we are going to do, and the second one is the Institution account. Since we are just creating a personal account, we only need to provide a primary phone number, alternative phone number, username, an active email address, and the password for the account you want to create. After providing all the account creation requirements, an SMS verification code will be sent to the phone number provided. This means that you need to have that phone number close to you if you are planning to create an account with them. After providing the SMS verification code, you’re all set and the website will auto redirect you to your account. One of the great features this website has is that their trading platform can go across all three different devices. Yes, you are able to use their trading platform from your PC, tablet, and smartphone. This makes it easier for people to be mobile, at the same time trade whenever they want, wherever they are! They also have an affiliate program that everyone can take advantage of! Their affiliate program pays 25% of the transaction for buying and selling, which is great. Their SMS PIN confirmation for withdrawals is a costly but useful feature to protect accounts from hackers. Now that we’ve created an account with Bitcoin.co.id, it’s time to look at their trading platform. Are you guys excited? We sure are! The excitement comes from the fact that not all websites today easily provide account creation services and usually ends up with a brick wall of identification processes that could take more than seven days to verify. There are two ways to get BTC here at Bitcoin.co.id, first would be to directly buy/sell it from them. And the other way is to trade through their Spot Market. We will be looking into this two different options starting with instant purchase. Buy/Sell Instantly – Not all exchange websites have this feature that is why it is really awesome to see that Bitcoin.co.id has one. To buy or sell BTC, all you need to do is log into your account head over to the left-hand side panel and select “Buy/Sell Bitcoin Instantly”; the system will then redirect you to the purchase and sell page. As mentioned earlier, this website is focused on the Indonesian market, that’s why their BTC prices are listed in Rupiah and not US Dollars. Minimum purchase is at 50,000 Rupiah per single transaction. Their exchange price is also 3% to 10% higher than other exchange websites today, making this choice a costly one. Spot Market – For people that love to acquire BTC through trading, you are able to do so here through their trading platform. Just click the “Spot Market” tab located on the left-hand side of the account page. Here traders are able to choose from different pairs of crypto/IDR. To name some of the available cryptocurrencies we’ve got BTC, BCH, BTG, ETH, ETC, LTC, NXT, WAVE, XRP, DASH, DOGE, and a few other altcoins that traders are able to choose from. They also offer standard leverage which is 1:1. What’s great is that they’ve completely removed the Maker fee for all trades and this is now down to 0%. Taker fee is at 0.3% this means that when you place an order to buy or sell BTC, you are not charged with anything except the bare value of the coins you are putting up. On the other hand, taking orders cost you money. The website accepts BTC and Rupiah deposits. This is great, since there are a lot of people that would prefer to have both options accessible for easier transactions. BTC Transactions – BTC transactions are always easier compared to Fiat deposits due to the hassle-free transfers. To deposit BTC into your account, all you need to do is generate an address or scan the QR code and transfer from your personal wallet. There are no deposit fees but if you want to withdraw, they charge 0.0005 BTC per transaction. The minimum withdrawal amount is 0.001 BTC and the daily limit is only 1 BTC per day. Completion of the verification process can greatly increase your withdrawal method. They also charge 0.0001 BTC for an SMS verification pin. You can remove this safety feature to save 0.0001 BTC per request, but this is always nice since no transaction will go through if it was not authorized by the account holder personally. Fiat Transactions – Wire Transfer is available for Indonesian residents and there is no charge for wire transfers as long as you’re transferring Rupiah. For people that live outside Indonesia and wish to deposit Fiat into their accounts, the charge would be 3% of your initial deposit when using EasyPay. Their main customer service channel through email and they have a different email address specifically for different departments. Their general inquiry email can be reached through support@bitcoin.co.id and they have three offices throughout Indonesia. All information regarding this can be read here. Overall, we found out that this website is a good website to get BTC at if you are from Indonesia. The reason for this is that their verification process requires government ID’s from Indonesian citizens, because, obviously, this website was made for them. For outsiders, we are only able to create an account and deposit BTC into their website but would have to endure high fees if we plan to transact in Fiat. All-in-all, the website Bitcoin.co.id, is a website that you guys should look into! Please let us know what you think about the website in the comments below. Am base in Malaysia. But this platform worked perfect?? ?